WASHINGTON — Two loaded and two empty crude oil trains operate daily over Amtrak’s Northeast Corridor in Maryland and Delaware, according a document submitted by the passenger railroad in response to a Freedom of Information Act request. Last month, Norfolk Southern, the freight railroad that operates the crude oil trains, went to court in Maryland to block the state Department of the Environment from making the same information available to McClatchy and the Associated Press. The Amtrak document also contains some details of Norfolk Southern’s crude oil train operations in Pennsylvania. That state last month denied requests from McClatchy and the Pittsburgh Post-Gazette to provide information about the shipments. Dave Pidgeon, a Norfolk Southern spokesman, declined to comment. In May, following a series of derailments, fires and spills involving crude oil trains, the U.S. Department of Transportation required railroads to notify states about train shipments of 1 million gallons or more of Bakken crude oil to help emergency responders better prepare for an incident. There is no federal law that shields the crude oil train information from public release. Nonetheless, railroads asked states to sign confidentiality agreements, and some states, including Maryland and Pennsylvania, complied. However, other states, including California, Washington, Illinois and Florida, did not sign the agreements and have made the crude oil train details available to McClatchy and other news organizations. In Maryland, according to documents filed on July 23 in the Circuit Court for Baltimore City, state Attorney General Doug Gansler’s office had voided the confidentiality agreements that a state official had signed. However, both Norfolk Southern and rival carrier CSX contested the attorney general’s ruling and sought an injunction to prevent the imminent release of the records. Pennsylvania is one of the largest single destinations in the country for Bakken crude oil by train. On Monday, McClatchy appealed the Pennsylvania Emergency Management Agency’s denial of an open records request for crude oil train details there. Amtrak owns or controls lines in Pennsylvania, Maryland and Delaware that Norfolk Southern uses for freight. The national passenger railroad is subject to the federal Freedom of Information Act. According to Amtrak, Norfolk Southern’s crude oil trains operate over 21 miles of the Northeast Corridor, the busiest passenger train route in the country. The crude oil trains travel between Perryville, Md., and Newark, Del., sometimes alongside Amtrak’s passenger trains. 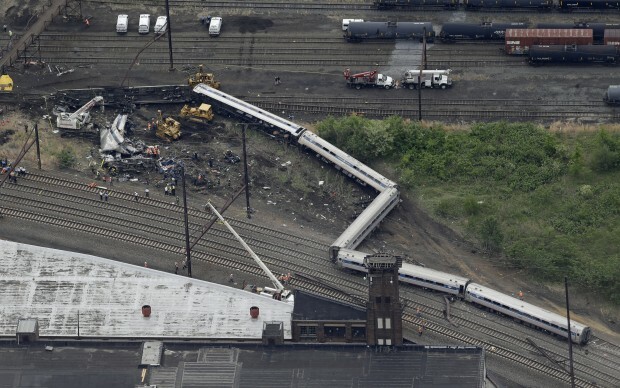 They also use a portion of a line east of Harrisburg, Pa., that Amtrak controls. The trains are generally 100 cars and weigh 13,500 tons loaded and 4,000 tons empty. By contrast, Amtrak’s flagship Acela Express trains include two locomotives and six cars, weighing a total of 624 tons. Freight trains commonly operate over the Northeast Corridor at night, but some run during the day. Amtrak restricts Norfolk Southern’s crude oil trains to 30 mph from 6 a.m. to 10 p.m. Overnight, the trains can operate at 50 mph. Norfolk Southern crude oil trains cannot exceed 135 cars on Amtrak lines. The Norfolk Southern trains supply the PBF Energy refinery in Delaware City, Del. The facility closed in 2009, only to be revived with rail deliveries of domestic crude oil.